Previous Partner in crime Jean Lazarou has blogged about something he’s been experimenting with for a couple of months. 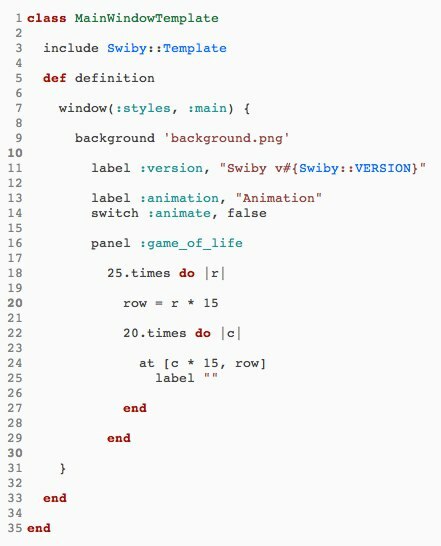 He’s taken the highly compelling RubyMotion, and his experience defining Swiby (that used JRuby), and made a worthy example of the Declarative UI style that I love. The casual way that Ruby’s grammar can be enhanced is very powerful. Except that it’s not really Ruby, it’s a subset of Ruby that cross-compiles to a native iOS app. Jean’s blog entry says much more. It shows the controller, plus a separated stylesheet - though this time using ‘teacup’, rather than the one that was made for Swiby itself a few years ago. Colleague Aaron Swartz’s death made the news today. It’s such a tragic loss to the field of computing and internet causes. I hope the industry finds a way to commemorate him.